Back for its second year, Imbibe Live promised to bring together an unmissable selection of drinks brands, features, tastings and seminars for the trade. While not as comprehensive as Rumfest for the rum and cachaça enthusiasts among us, Imbibe Live lived up to expectations and was a great opportunity to network and taste a number of previously untried rums as well as correct a previous viewpoint, regarding Salto Cachaça (more on that below). Although my attendance at Imbibe Live was primarily for the rum and cachaça, I approached the day with an eye for anything else related to Cocktail making and mixology. With both Funkin and Monin exhibiting, it was an opportunity to taste and see some of the best mixing purées and syrups available to the trade and consumer. Started in 1999, Funkin has become the number 1 selling purée brand in the UK, with its 100% natural and easy to use fruit purées. The brand has been expanded to include syrups; ready made cocktail mixers, Just Add Juice (JAJ) smoothie mixers and their bartender inspired fusion range. 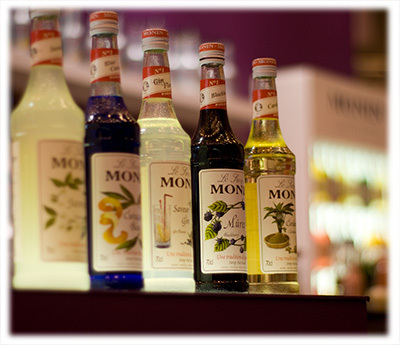 With over 100 flavours of syrups, liqueurs, gourmet sauces, fruit cocktails and smoothie mixes, Monin is one of the world leaders in the drinks industry. With over 2000 recipes on their website, the flavours of Monin opens up a huge range of cocktail potential. A short walk through the stands found me enjoying a Caipirinha and talking with the distributors of PITÚ cachaça. Named after a large type of shrimp found in the north-eastern rivers of Brazil, PITÚ is one of Brazil’s largest distillers and exporters of cachaça to the international markets. Hugely popular in Germany, PITÚ promotes itself as a premium brand. At 40% ABV / 80 Proof, PITÚ is a white cachaça, with a semi-sweet and fruity taste. Keeping with cachaça I then moved on to the Salto cachaça stand. While relatively new to the market, I had previously tried Salto at last October’s Rumfest and at the time had walked away with a slightly sour taste in my mouth. Maybe I’d had a few too many samples already that day, but when trying what I thought was a new cachaça, I found it tasting completely off and could have sworn blind it tasted salty. What I didn’t realise at the time was that Salto was a cachaça blended with citrus flavours. So arriving at the Salto stand and finding three different bottles, I was introduced properly to Salto, Salto 37 ½ and Salto 39. Salto 39 is a 39% ABV / 78 Proof white cachaça, with a clean, fruity cachaça taste. 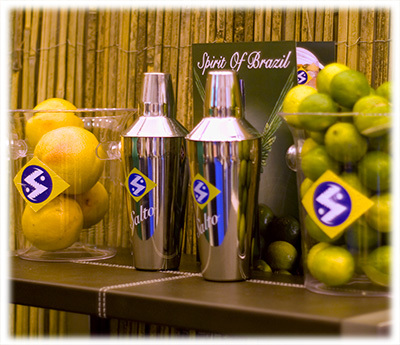 Salto 37 ½ is a 37 ½% ABV / 75 Proof cachaça with a hint of hint of citrus flavours. Lastly is the original Salto, which is a 24% ABV / 48 Proof white cachaça, blended with the refreshing citrus flavours of grapefruit, lime and bitter orange. Personally I prefer either the cleaner taste of the Salto 39 or the more subtle citrus flavours of the Salto 37 ½, but it can’t be denied that Salto brings something uniquely different to the UK market with a flavoured cachaça. El Dorado; English Harbour Rum; 19 Spiced Vanilla Rum; Plantation Rum; St Lucia Distillers including their Chairman’s Reserve, Toz and Admiral Rodney rums; The Rum Experience with tastings including Ron Zacapa, Saint James Rhum, Ron Atlantico, Pusser’s Rum and DonQ Rum; Ron de Jeremy; The Kraken Black Spiced Rum, Ron Diplomático and Ron Aguere. 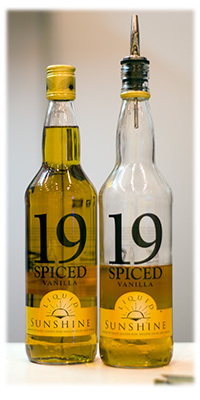 Also to be found alongside English Harbour on the Malcolm Cowen stand was 19 Spiced Vanilla Rum, from Fernandes Distillers. Catagorised as a spiced rum described as “A blend of finest golden rum, mellow spices and vanilla.” Although upon tasting and getting a big taste of vanilla, over and above the taste of the spices I think I could be forgiven for mistaking it for flavoured rum. However, irrespective of which category I might try and place it in, I have to agree with the Trinidad distillers comment that it comes “With a smooth and distinctive flavour it’s a taste to charm the tastebuds.” Bottled at 35% ABV / 70 Proof, this spiced rum is being pushed as a cocktail rum as well as being suitable for drinking neat over ice. I’m in agreement with this as I could easily see myself sipping a glass of this over ice, but equally as I stood there tasting 19 Spiced, I found myself thinking about what sort of cocktails this could go into, including giving a more distinctive taste to cocktails that would normally contain a vanilla flavoured vodka. Hoping over to the other side of the floor on the Bibendum Spirits Bus brought me to the Plantation Rum Tiki Bar stop, hosted by the very lively Paul McFadyen. 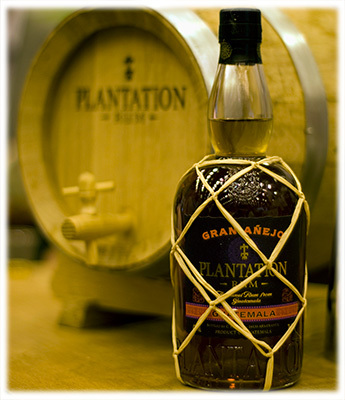 Among their usual collection of excellent blended Plantation rums was to be found their latest addition to their range, the Plantation Gran Añejo Rum from Guatemala. Making up Plantation’s complete blended rum line are: Plantation 20th Anniversary Extra Old Rum (Barbados), Plantation Gran Añejo Rum (Guatemala), Plantation Grande Reserve Rum (Barbados), Plantation Original Dark Rum (Trinidad) and Plantation Original Dark Overproof Rum (Trinidad). And if memory serves correctly, they were all on offer to sample, either neat or as part of one of the cocktails that the Plantation team were busy putting together throughout the day. Having tasted most of these rums before at a previous Rum Club meeting, I opted for a cocktail while waiting for the opportunity to try the new Plantation Gran Añejo Rum from Guatemala. The cocktail was a refreshingly fruity Rum Punch and was certainly welcome after so many previous neat samples. Knowing how good Plantation rums are, I was looking forward to trying out the new Guatemalan Gran Añejo and I can happily say that it didn’t disappoint. Bottled at 42% ABV / 84 Proof, Gran Añejo is a very smooth and easy to drink rum, which makes for a suitable sipping rum as well as the base for a number of premium cocktails. Those of you who haven’t had the opportunity to try out Plantation Rum should get themselves down to the Notting Hill Rum Club at Trailer Happiness on the 5th September 2011, where Paul McFadyen is lined up to showcase Plantation Rum. Shows like Imbibe Live are the perfect opportunity for distilleries to showcase their existing established lines as well as any new offerings, so along with the new Gran Añejo from Plantation Rum, another rum distillery taking the opportunity to introduce their new wares was St Lucia Distillers, with not 1, not 2, but 3 new rums in their line-up. Having already tried the new Chairman’s Reserve Silver and the as yet to be released Chairman’s Reserve 1931 at the Notting Hill Rum Club on the Monday, it was the new Chairman’s Reserve The Forgotten Casks that I most interested in trying. Now don’t get me wrong, I wasn’t passing up the opportunity to try these other great rums lightly, but knowing how many other rums were still to be tasted during the day, I chose not to sample the Silver and in regards to the 1931, my understanding was that they had only the one bottle in the UK and having already written about it I didn’t want to appear greedy… So on to The Forgotten Casks and wow, what a great tasting rum as well as a great back story. In May of 2007, a fire destroyed several buildings at St Lucia Distillers and as a result a number of finishing casks were moved from where they were housed and simply forgotten about for 3 years. Chairman’s Reserve is a blend of rums that have been matured in American oak casks for an average of 5 years, which are then blended and reintroduced to oak for a further six months to marry. Being left to marry for another 3 years has produced a premium sipping rum with more depth and character than the normal Chariman’s Reserve. Bottled at 40% ABV / 80 Proof, Chairman’s Reserve The Forgotten Casks will be introduced in the Autumn and will make a handsome addition to any bar’s premium back shelf. Despite trying Toz White Gold Rum on the Monday evening at the Rum Club it had been as part of a rather excellent Daiquiri and as such I hadn’t had the opportunity to taste it neat. So with a bottle of it in front of me how could I pass up the opportunity to ask the The Boutique Bar Show’s charismatic Andrew Scutts for a sample. 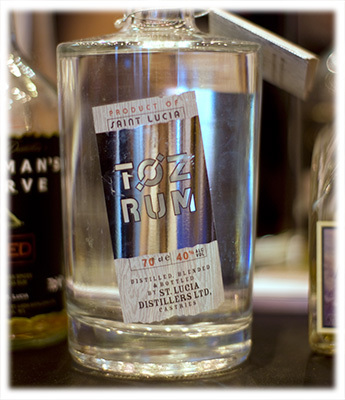 Toz White Gold Rum is matured for 5 – 8 years, before being finished in sherry casks and then charcoal filtered and finally bottled at 40% ABV / 80 Proof. It is an outstanding white rum and makes for an excellent base to any premium Daiquiri, Mojito or any other white rum based cocktail. Also on show from St Lucia Distillers was Admiral Rodney Rum, Chairman’s Reserve and Chairman’s Reserve Spiced. 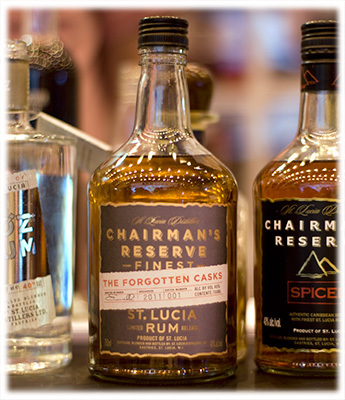 All are exceptional rums and the Chairman’s Reserve range represents great value for such premium quality rums and I for one can’t wait to add the new Chairman’s Reserve rums to my collection. After a bit of opportune networking with the Marketing Manager of J. Wray & Nephew UK, it was on to The Rum Experience to try the selection of rums on offer, including El Dorado 12 Year Old Rum, Ron Zacapa Centenario Sistema Solera 23, Saint James Royal Ambré 45 Rhum Agricole, Ron Atlantico, Pusser’s Rum and DonQ Añejo Rum. Had I been to the show on the Tuesday, this would have been a blind tasting with the opportunity to enter into a competition, however, being the Wednesday and the competition no longer running, I was taken through the rums one at a time. In all honesty I don’t quite recall the order and as such I’m not even going to try to list them correctly. Of these I had only tried the El Dorado 12 Year Old and as described earlier, I find this an exceptional rum and could easily picture myself sitting under a palm tree on a white sandy beach with an ice bucket and a bottle of this rum to while away the time. Having recently acquired a bottle of Ron Zacapa Centenario Sistema Solera 23 from the Central American country of Guatemala, but not having taken the opportunity to taste it as yet, I was more than happy to sample this Solera blended rum. Made from virgin sugar cane honey and using a method of Solera blending, the aged rum is blended with younger rums and then aged again for a period of time, before the process repeats itself. This process continues until the final product is ready to be bottled at 40% ABV / 80 Proof, with a blend of rums of 6 to 23 years old in age. Martinique’s Saint James Royal Ambré 45 Rhum Agricole represented the only other non-molasses based rum to be tasted at Imbibe Live and I can happily say that I’m pleased it was brought to the show. Rhum agricole is a type of rum synonymous with the French Caribbean Islands where freshly squeezed sugar cane juice is used as the base for making rum. Bottled at a stronger 45% ABV / 90 Proof, I find Royal Ambré has a sweeter aroma and taste than a typical rum and like all other light rhums I’ve tried, I am reminded of the taste of cachaça. Had I been doing the blind taste test I might have got the above 3 rums correct, but I’m pretty sure I wouldn’t have guessed the next one correctly. Ron Atlantico from the Dominican Republic uses three stages of aging and blending to create an exceptional and sweeter tasting rum than might be expected from a molasses base. Atlantico’s master blender takes a selection of their finest small batch aged rums and blends them together in private casks. The private cask blend is then aged further to produce a mellower and more complex rum. In the final stage the solera method is used to bring the age blend up to 15 to 25 years. Bottled at 40% ABV / 80 Proof, this is a great rum which deserves a space on the back shelf. With most of the rums at the show being white, golden or spiced, it made a nice change to see an old navy dark style in Pusser’s Rum. Using the original blending information from the Royal Navy, Pusser’s Ltd was formed in 1979, on Tortola in the British Virgin Islands. 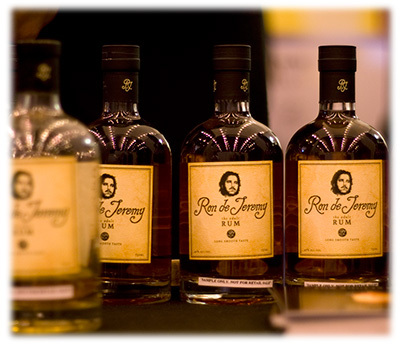 This multi-award winning rum is a blend of five West Indian rums and was issued on board Royal Navy ships until 1970. Bottled at 54% ABV / 108 Proof this is a serious rum, with over 300 years of historical background. Last of the rums tasted on The Rum Experience stand was the DonQ Añejo Rum. This award winning Puerto Rican rum comes from the Destilería Serrallés in Ponce. Considered by locals to be Puerto Rico’s finest rum, the DonQ brand was introduced in 1932 and is named after the protagonist Don Quixote, from the classic Spanish novel of the same title. Bottled at 40% ABV / 80 Proof, this is a light golden rum that has been aged between 3 and 5 years. Moving along to Imbibe Live’s red light district found me staring at a life size cardboard cut out of Ron Jeremy, promoting Ron de Jeremy. For those not familiar with his more ‘artistic’ films Ron Jeremy is the most famous male adult entertainment star in the world. So what may you ask has that got to do with rum. Simply put, nothing other than the fact that Ron’s first name is Spanish for rum and the opportunity for a tongue in cheek advertising campaign with some very cheeky taglines, such as “For Adults Only” and “Long Smooth Taste”. However, what is surprising about this hand crafted 7 year old, 40% ABV / 80 Proof rum from Panama is how good it is. While the celebrity affiliation may be somewhat gimmicky, the rum isn’t and I would certainly recommend contacting Master of Malt in the UK to purchase a bottle or more. Leaving behind the rather stiff cardboard Ron, weighed down by my newly acquired Ron de Jeremy t-shirt and a sample of his most excellent rum, I suddenly found myself in perilous waters with a need to defend myself from monsters from the deep. I had found the The Kraken Black Spiced Rum stand and having missed out at last year’s Rumfest, I finally got a chance to try this 40% ABV / 80 Proof spiced rum. 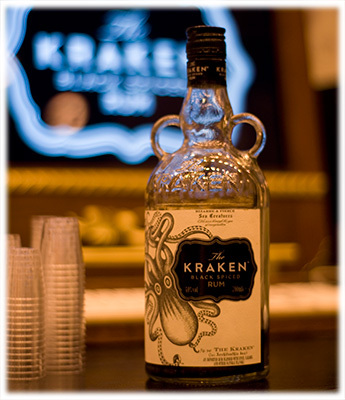 Distributed in the UK by Marblehead, Kraken is a blend of Caribbean rums with 11 secret spices and is is a welcome addtion to the range of spiced rums available here. Moving on from those dangerous waters, gave me a chance to chat with Chris Seale, of Speciality Brands, who are the UK distributor of the Venezuelan rum brand Ron Diplomático. 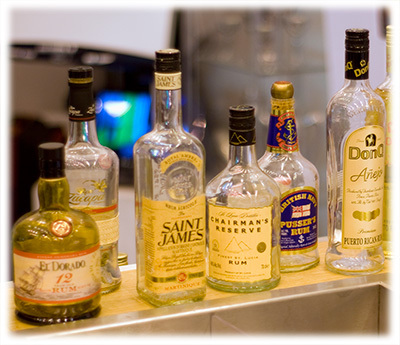 Produced in Venezuela by Destilerias Unidas, the company has been distilling spirits for over 45 years. 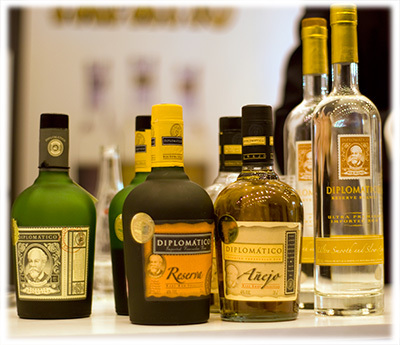 Along with Ron Diplomático, Destilerias Unidas also distils Cacique and supplies the majority of the alcohol for Pampero rum. With all four of their Diplomático rums to taste at the show, Chris introduced me to each one; the super premium Diplomático Blanco, the 4 year old Diplomático Añejo, the 8 year old Diplomático Reserva and lastly, the 12 year old Diplomático Reserva Exclusiva. All are bottled at 40% ABV / 80 Proof and are all exceptional spirits, with the three aged rums offering great value for money when considering their quality. Of course that last statement isn’t to take anything away from the Blanco, but with the higher quality of this smooth blanco coming with a higher price, it does make it one of the more expensive white rums in the UK market. In conclusion though I can happily say that Ron Diplomático has certainly been added to my list of great rums to keep an eye out for. Before leaving the show I decided to pop back to the Plantation Rum Tiki Bar and before I knew it I’d managed to throw caution to the wind and joined in with several attendees getting a tasting tour through the blended Plantation range. It was at this point that I also spotted the Canarian rum brand of Ron Aguere. Unfortunately, no longer being able to do any justice to the idea of a proper tasting I sampled the rum and caramel toffee blend of their Licor Ron Aguere Caramelo. Distilled using “Volcanic Rum” from the Canary Islands, it is bottled at 24% ABV / 48 Proof, this deliciously sweet flavoured rum is best served cold and comes in a rather unique aluminium bottle. Ron Aguere produces several other rums including a Blanco, an Oro, a 7 year old Añejo and both Honey and Banana flavoured rums, which I hope I will have the chance to taste at some point in the future. Leaving the Imbibe Live 2011 show somewhat richer in knowledge, contacts and intoxication, I even managed to leave with my hat still on, for which I should at least give a quick “hats off” to Aperol for letting me nab one of the last remaining straw-hats they had on their stand. So with highlights of the day including finally tasting the El Dorado 12 and 15 Year Old Rum’s, trying out the soon to be released Chairman’s Reserve The Forgotten Casks, as well as tasting the excellent Plantation Gran Añejo Rum, to name but a few, it just leaves me to say thank you to Imbibe for organising the show, as well as a thank you to all of the people that spent the time with me discussing their products. With that I can’t wait to see what the show will have to offer next year.